1. Size 2. process 3. personnel 4. environment and 5. Required quality. 2. State the limitations of conventional waterfall approach. 3.Mention the characteristics of project management? 5. What are three process perspectives? • Software development is still highly unpredictable. Only about 10% of software projects are delivered successfully within initial budget and schedule estimates. • Management discipline is more of a discriminator in success or failure than are technology advances. • The immature level process. of those techniques to improve that process and its product. 8. what are the five basic parameters in software cost model? 9.What is software project management? which software are planned, monitored, and controlled. ▪ A specific plan or design. 11.List some of the key characteristics of project? o Work is carried out in several phases. o Non-routine tasks are involved. 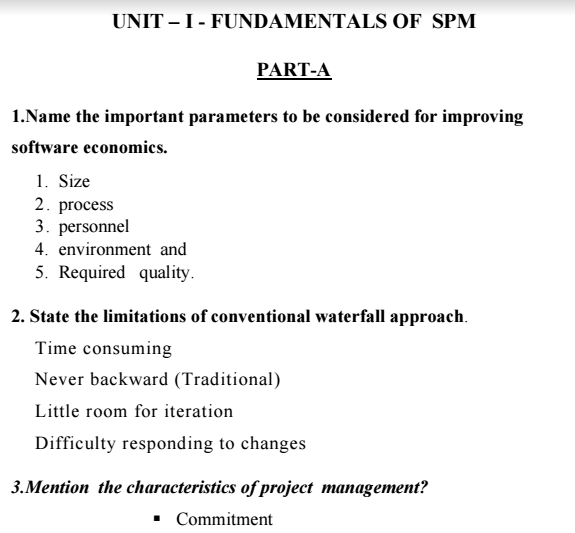 12.List the characteristics of the products of software projects? 13. How software projects different from other projects? invisibility of many of their products. 1.What is meant by the term “Test Artifacts”? • The test artifacts must be developed concurrently with the product from inception through deployment. Thus, testing is a full-life-cycle activity, not a late life-cycle activity. • The test artifacts are communicated, engineered, and developed within the same artifact sets as the developed product. • The test artifacts are documented in the same way that the product is documented. 2.Give the typical contents of an architectural baseline. * To get Clear; figures / diagrams, tables / values, answers / explanations and more, download the Software Project Management Viva Interviews Questions Answers PDF.